How did we Come to use Ultrasound? In the search for a way to stimulate bone repair, and after futile attempts to shorten the healing process by pharmacologic and hormonal methods, our attention turned to a method successfully used in technology (especially structural engineering) whereby vibrations are used to affect the density of solids and other media. A review of the literature shows that at least 46 different approaches have been taken in an attempt to stimulate bone repair, including operative procedures, chemical and biochemical agents, drug treatments, and physical methods. Operative procedures have proven effective in suitably selected cases. Of the physical methods, efficacy has been demonstrated for electrical stimulation and ultrasonic therapy. The basic mechanism of action of both modalities is the piezoelectric effect. But treatment with ultrasound offers several advantages over electrical stimulation: (1) the instruments can be used for various applications, (2) the necessary equipment is widely available, (3) ultrasound therapy causes no side effects or complications, and (4) therapeutic ultrasound has been used clinically for 30 years. 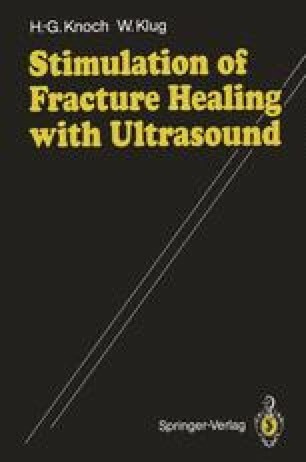 It was a natural step to apply the compaction properties of ultrasonic energy familiar in engineering to the compaction of callus tissue at a fracture site. This line of reasoning led us to consider the use of vibrational energy in the broadest sense.